A photo of Pope Francis has gone viral on social media after he was captured in a classic rapper pose during a visit to the Central African Republic (CAR). The now famous photo was taken during a speech in the capital, Bangui, and has been tweeted more than 100,000 times. 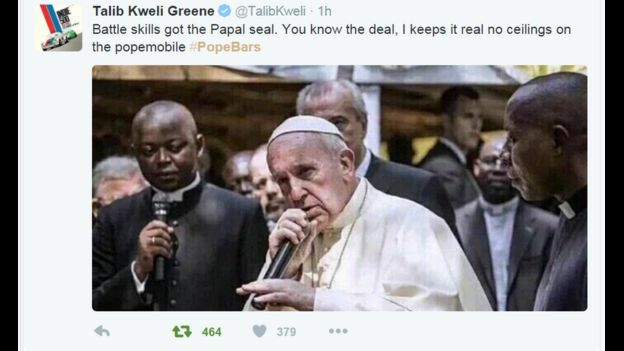 Tweeters have been making thousands of imaginary rap lyrics, known as bars, under the hashtag #PopeBars. The Pope was in the CAR as part of a three-nation tour to Africa which also took him to Kenya and Uganda. The visit was Pope Francis' first to the continent and he spent six days in the three countries where he was greeted by thousands of the faithful. In Bangui he also addressed Muslim worshippers in a mosque where he said that "Christians and Muslims are brothers and sisters". The country has experienced after nearly three years of violence between Christians and Muslims.